We are an informal charity and never ask PALS or the public for money. See "Drug availability" link in the menu bar above. The voluntary sponsors of this web site made what may be a most important discovery of a previously unrecognised excitotoxic ("bad") protein upregulator (enhancer) exclusively present in ALS, FTD, Alzheimer's, and Huntington’s victims. Refer to Section 9 "Mode Of Action" (below). They developed a completely new drug for ALS which appears to work much better than the only drug for the condition approved worldwide, `Riluzole`™. On May 5th. 2017, a second drug for ALS was approved in the USA, `Radicava`™ (aka `Edaravone`) which is the first new ALS drug to be approved in 22 years. This is excellent and much needed news after all that time. Refer to Section 3 "Options" (below). According to the manufacturers data, it promises some half the efficacy of RCH4. However, RCH4 has many times more than the number of patient-treatment-years evidence than the `Radicava` clinical trial that got it FDA approval. Please note that we make no claims of efficacy, nor do we offer any interpretation of the data, evidence of which is provided by PALS who take RCH4 and submit their monitoring reports once every month. PALS who take RCH4: We are not their doctor, and cannot advise them, therefore we refer to them as our "friends". Nothing in this web site may be considered as medical advice. There are no visits to a clinic - PALS send their own monthly monitoring reports in accordance with a reporting form. RCH4 is an Investigative New Drug and does not have Regulatory Authority marketing approval in any country. It is not a "cure" (there is no "cure" for ALS), however the evidence is that it slows the progression of ALS more than anything seen before. It is statistically effective (p=0.0001) in 84% of PALS. Unless there is some clinical contraindication, we accept anyone who asks for help if we have the funds. We have no exclusion criteria. PALS must have written confirmed diagnosis of ALS and have the written permission of a Medical Doctor to take RCH4. Sometimes we require blood tests for some specific parameters. There are also some forms which need to be signed, example, Patient Informed Consent, non disclosure agreement etc. The Northeast ALS Consortium (NEALS) did a survey of clinicians and clinical researchers who concluded that any therapy that resulted in a change of 20% or greater in the slope of the ALSFRS-R would be clinically meaningful, but there was no therapy available to schieve it at that time. However, now there are two drugs which can achieve far better than that: Genuine Edaravone (Radicava™ - Not counterfeits) and RCH4. We must rely on the monthly monitoring reports from our PALS friends in fourteen countries (86% Europe & North America. Four Ethnicities) over some years, the accuracy of which we cannot independently verify. Accordingly, we make no claims about efficacy nor do we offer any interpretation of the data (as treatment is ongoing, data can change). There are many reports on the Internet by users of of RCH4 discussing safety and efficacy. For example the ` Patients Like Me ` forum. Your clinic will have a multidisciplinary team of people available to help you. Whereas the obvious principal person will be the neurologist, but after confirmation of diagnosis, in fact others play the most important roles, e.g., nutritionist, speech therapist etc. Some chooose not to follow advice or fail to observe that which is recommended - this is unwise. If you are referred to a palliative care consultant, do not panic. Some clinics involve palliative care from an early stage which can be very helpful and the involvement should be welcomed by the patient. The first approved ALS drug `Riluzole`™ (Sanofi Aventis) may not slow the progression rate sufficient to reflect in the ALSFRS-R score. It extends "time to tracheotomy" by 75 days + - 15 days (Source: Sanofi). This data emanates from a very large study of some 900 ALS patients. Extended time to tracheotomy does not necessarily equate to life extension. It does not appear to slow the progresssion of ALS. Slowing or stopping the progression does equate to life extension - provided that infections or other events are avoided. As far as is known, no ALSFRS-R decline charts have been published for `Riluzole`™. Radicava ™ (Mitsubishi Tenabe Japan) (Also known - incorrectly - as Edaravone) It is the second ALS drug to gain marketing approval in the USA. It slows the progression of ALS by 33% and is effective in 7% of PALS (Data 2016 Source: Mitsubishi Tanabe). It was approved after a small 6 month clinical trial in selected Japanese patients that met a specific exclusion criteria. In 93% of PALS it had no efficacy in earlier trials. RCH4 slows the progression of ALS by 63%. (non-responders included, 70% slowing of progression when the 16% non-responders are excluded) and is effective in 84% of PALS over the whole treated population (Data 2017 Source: Patients own monthly monitoring reports >4,000 datum points). RCH4 does not have Regulatory Authority marketing approval as we do not have the $Millons needed to gain approval. As a charity, PALS treated with RCH4 are not selected or subject to any exclusion criteria as is done for clinical trials. Everyone asking for help is accepted if possible. Prior careful selection of candidates for clinical trials who are likely to do better, skews efficacy data in favour of the drug being tested in the trial - which can be misleading. RCH4 is provided as a charity, not a clinical trial. Fake counterfeit ALS drugs are widely available from on-line "reputable" so-called "non profit" entities. These counterfeits mostly originate from China and India. We estimate that some 30% of all ALS drugs (by value) in circulation are now counterfeit. Under no circumstances buy these lower cost fakes. Commonly, their modus operandi is to offer free telephone "advice" or "consultation", which in essence is a sales pitch for their counterfeit drugs. Sometimes their "doctor" issues the prescription. A medical doctor cannot legally issue a treatment prescription without examining the patient and / or having access to the patients clinical file and history. Do not send them money, especially to those whose web site registeration is hidden by a proxy and cannnot be traced. Stem cell treatment Unless a formal, authorised clinical trial, again, under no circumstances consider stem cell treatment from any of the many clinics advertising their services in this field. None of them can demonatrate any evidence of efficacy, there are confirmed reports of some catastrophic outcomes and they charge very large sums of money. Exercise ​ Whereas doctors rightly recommend that their patient should exercise to keep limbs and joints flexible as possible, but that must not be interpreted as doing workouts in the gym - or whatever. A physical therapist may be likely to set exertion goals for the patient to achieve - which is well meaning, but a very bad idea and counter productive for a PALS. Vitamins can indeed be helpful for general health in modest amounts, but have no proven discernable benefit for ALS. There are a vast range of supplements promoted by commercial entities. Some of which are recommended by PALS but are entirely unsuitable for ALS /MND, just leading to more problems. Some supplements actually exacerbate the neurological situation. Numerous studies have been done in a range of supplements, but none showed any statistical evidence of efficacy. In general, unless your doctor has a specific reason to recommend a particular supplement, we prefer if our PALS friends take none at all other than Vitamin C or / and Vitamin D and in some cases possibly B6 - in modest amounts. 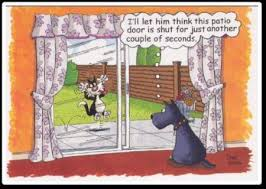 There are some well known "Protocols" which are virtually guaranteed to shorten the life of any PALS. Popular diets are unhelpful. Many of our PALS friends have a history of following fad diets, went to the gym more than once per week, were fitness enthusiasts, were in the military or sold supplements. Therein surely rests a lesson. If you are a PALS, do not go to a gym. The diet which PALS should focus on is one of high fat, high protein and high calorific value together with fresh green vegetables, and avoid high ruffage content foods - again, unless their doctor has a specific reason to recommend otherwise. We do not recommend winter "Flu jabs" for PALS because the risk of complications may outweigh benefits, but you must be guided by your doctor. There is a difficulty in establishing the average starting ALSFRS-R score (ALS Functional Rating Scale - Revised) due to the fact that unfortunately most PALS have not had their score assessed by their neurologist, or their score is not noted in their clinical files or their formal diagnosis of ALS. Where this information is not available, the score decline is estimated for the time of diagnosis in the light of information provided by the patient. However, the estimated decline rate prior to starting treatment is virtually the same as the placebo decline data from the very large Pharmaceutical Industry ALS clinical trial PRO-ACT database. Refer to sections 7 & 8 "Accuracy of data" discussion (below). 16% of PALS treated with RCH4 are non-responders, i.e, subjects decline remains unaltered after start of treatment - it does not work. 84% the decline slows in comparison to each subjects decline during an average of 15 months prior to each person starting RCH4. In this group, the results vary from marginal slowing of the progression or long term stability or reversal of the decline. (Physical improvement). There are no reports of any related side effects other than short tem stinging if used right out of the fridge (too cold, not holding syringe in the hand to come to body temperature first) or in a few instances, small bruising at injection site. This is rare, but can occasionally be experienced with any injection. That is not an issue. In some countries we offer an oral method of administration instead of injection, however that is a developmental programme and will not be globally available for some time until there is sufficient asurance of efficacy. As a charity critically short of funding everything takes a very long time after the `ALS Untangled`organisation lead investigator maliciously and untruthfully accused us of being criminals and a "SCAM", immediately causing our charitable financial support to collapse. For the same reason, there cannot be the double blinded, placebo controlled clinical trial required for the drug to gain approval. Our only source of funding now is from our own personal pockets. Thefore the future of this drug is very uncertain. 52% of the total RCH4 treated population stabilise for periods of 4 months or more. 26% stabilise for 6 months or more, 18% for more than a year and 4% improve - i.e., their ALSFRS-R score goes up (Data 2017 Source: Patients own reporting). Whereas ALS is known to plateau for a short time in 18% of the general ALS population (excluding those selected for clinical trials who may not represent the average due to trial exclusion criteria and few trials extend beyond six months), but more than three months may be unusual, and certainly more than a year would be very unusual. Important note: Treatment is ongoing therefore data can change. These figures may reflect the natural heterogeneity (it varies widely) of ALS, being possible sub-types of the condition, but there is no conclusive evidence or exact definitions for sub-types. Further, it may not be ALS, but some other condition which presents the same. 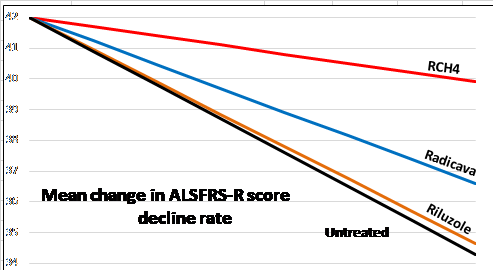 As the ALSFRS-R score is a subjective observation, it will likely be scored differently by any two different people. It is said that the PALS must be scored by a specialist medical professional - but this is not the case. In fact the precise ALSFRS-R score is not particularly relevant. What matters is the CHANGE in the score over exactly the same time periods. Provided that the SAME person (e.g., the patient or a care giver) does the scoring every month over a long time, the submitted change in data is very accurate. Further, scoring by the same person over extended time ensures elimination of patient or carer bias as the submitted data would rapidly exceed the envelope of credibility. Monthly monitoring reports are submitted to us by all our PALS friends. This monthly information comprises of 6 health parameters. One of these parameters is the ALSFRS-R score. This is an ongoing record of points allocated to 12 questions. As every monthly report form is submitted, the information is automatically picked up by a database and the statistics updated in real time. We therefore maintain a very accurate analysis of each PALS, enabling pro-active ongoing management of their RCH4 treatment if possible. Before we can consider anyone, as a prerequisite, we require copy of their formal written diagnosis of ALS, clearly identifying the clinic, the tests which were indertaken, the neurologist who arrived at the diagnosis, and his or her contact details. Following that, we also require some paperwork, for example, a signed "Patient Informed Consent" document, a letter from their doctor also clearly showing his or her contact details, giving permission to take RCH4, etc. If we are not satisfied with the diagnosis, the patient would need to be willing to travel to Europe for a physical examination. Although we never ask PALS for money, travel costs would have to be met by the patient. The ALSFRS-R rating scale is the global gold standard for assessment and progression of the condition. 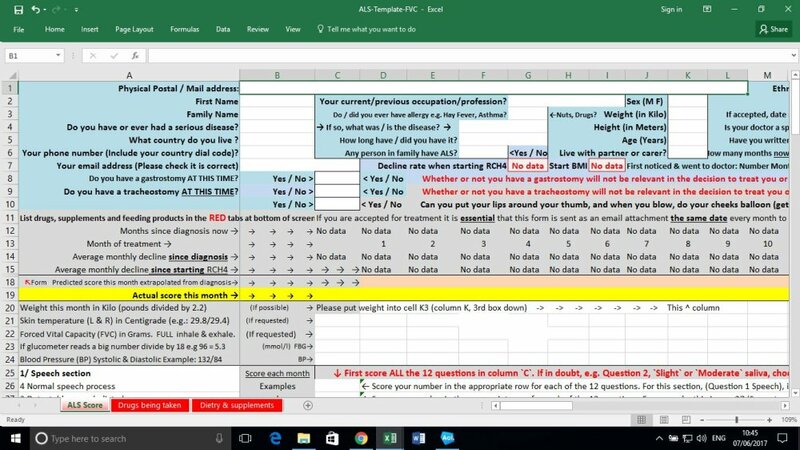 The RCH4 monitoring form is unique in that its algorithms automatically update the condition parameters and statistical analysis as each of the 17 questions are answered once each month. The input goes to an integrated database which renders an ongoing detailed analysis and trend evaluation of every PALS in real time, enabling better case monitoring than any clinic. The form is dynamic, i.e., it changes depending on the answers to some questions. This charity has never made any claims of efficacy at any time, however we do have considerable data compiled over decades of treatment-years. In the absence of other contraindications, in relation to ALS, we have no inclusion/exclusion criteria. We accept anyone (if we have the resources) on a humanitarian basis - unlike clinical trials. We do not choose only those who are more likely to do better - thus skewing the statistical analysis in favour of the efficacy of a new drug. There is no placebo control group, so our PALS friends never get a "dummy" drug. A few PALS taking this new drug demonstrate a slow improvement (reversal) in their ALSFRS-R score but it is over many months. Although all have a confirmed diagnosis of ALS, these cases may raise a question as to the accuracy of their diagnosis. In the event of erroneous diagnosis, then efficacy data is being demonstrated in some other neurodegenerative condition. From the perspective of the patient, the name of a disease is irrelevant if the progression is slowed, stopped, or better. -1.028 ←`PRO-ACT` database ALSFRS-R average monthly points decline in all Pharmaceutical Industry clinical trial Placebo arms of 12 months duration. -1.148 ← Placebo comparison: RCH4 subjects average monthly decline from diagnosis to start of treatment. An average of 15.8 months of no treatment before starting RCH4. Being within 3%, this is virtually identical to the Pharma trials placebo arms data. This confirms the accuracy of self-reporting. (Journal Amyotrophic Lateral Sclerosis Volume 13, 2012 - Issue 2 also confirms this). As there was nothing else which slows the decline rate in ALS, there was no concomitant ALS medication (other than`Riluzole` being taken by some [44%] RCH4 subjects) except palliative care for ALS symptoms, e.g,, oral Botox for excessive saliva etc. -0.242 ← RCH4 subjects monthly decline after starting treatment. This efficacy in RCH4 responding subjects = 62% (p=0.0001) slowing of the ALS progression rate compared to their projected. (70% p=0.0001 slowing of progression when non-responders are excluded from the data). (Source: Patients own reporting). As RCH4 treatment is ongoing, therefore the data can change. 824 ← Number of `PRO-ACT` database Placebo arm subjects - i.e., 824 placebo patient-years. b/ Clinical trial duration of 1 year + - 23 days. Subjects do not necessarily attend their trial clinic on day 365. Note: There are relatively few ALS clinical trials > 1 year. -1.058 ← Note: The monthly decline rate in treated subjects in the `PRO-ACT` Pharmaceutical Industry combined ALS clinical trials database demonstrates a 3.01% increase in the ALS monthly decline. Refer to next paragraph. While no benefits were detected in the treatment arms (patients who got a testing drug) of any of the Pharmaceutical Industry ALS clinical trials in the large PRO-ACT database, in fact the subjects did slightly worse. It is unknown whether this is due to the effects of the drugs they were testing. This new ALS drug targets a newly found agent ("defect") in the immune system. That the drug, a type of molecule somewhat similar to a monoclonal antibody, safely fixes that defect is now certain and undoubted. The defect is also certainly a factor in the promotion or stimulation of ALS, however it may not be the only defect. There may be others. RCH4 originates from organ transplant rejection and immunity research. An anomoly triggered attention to ALS, so in 2010 the sponsor of this web site started a project HERE to obtain ALS blood and then tissue specimens. Surprisingly, a previously unrecognised agent was noted. Accordingly, the number of neurodegenerative diseases investigated was widened. Investigation into the origins of all the specimens demonstrating the anomalous signature revealed that they exclusively originated from patients diagnosed with ALS, FTD, Alzheimer's, or Huntington’s. A specific B-cell sub set was identified as the source of the newly recognised agent (operationally termed `MRCH`) which, in turn, upregulates the expression of a protein, which in excess, is excitotoxic. The B-cell sub set lipid raft receptors were characterised and a molecule developed which recognises that receptor and nothing else - therefore indicating a notably safe Mode Of Action (MOA) profile. This has been confirmed after years of treatment. It cross links the offending B-cell lipid raft target receptor, causing apoptosis (eliminates it), thus suppressing the expression of the offending protein. We were always declined funding despite repeated requests, therefore all funding was from private sources instead. Emanating from that, for legal and intellectual reasons, no papers have since been published, nor has the dose regime been referred to. As the public nor PALS were never asked for contributions, no taxpayer funds, no research grants were involved, and it personally cost us an immense amount of money, the reality is that it now may be counter productive to do so. Refer to the `About Us` tab in the menu at top of this page. Just because the drug is free does not mean it is cheap and useless. In fact it is scarce and immensely expensive. Due to lack of any external source of funding we must pay the cost ourselves as a charitable undertaking, therefore the number of patients we can afford to treat is very limited. Accordingly we avoid publicity or recognition. From time to time when we can afford to treat more PALS, we publish a temporary web site inviting those who may be interested to apply for help. You may have issues which would preclude you from using this drug. The current status of this drug is experimental and it does not have Regulatory Authority approval in any country. We cannot afford to do more blinded, placebo controlled clinical trials. Accordingly, although there exists considerable clinical data indicating notable safety and efficacy over decades of patient-years, in the abscence of trials, RCH4 must still be considered as an unproven treatment. Do not expect a cure - that is extremely unlikely and probably impossible with existing technology. The terms `ALS` and `MND` are commonly used as the same thing, whereas, strictly speaking there may be small differences in the definition. There is no clear biomarker ("test") for ALS and is difficult to diagnose. In fact ALS is probably a number of very different diseases which `present` (the observed symptoms) the same. An example would be Lyme disease. These are referred to as `mimics`. If not entirely different diseases, they are at least different sub types of the disease. Accordingly, one single drug or treatment is unlikely be effective for all patients. Whereas increasing knowledge of the genetic mutations PFN1, SOD1, TLS/FUS, TPD43, C9orf72 etc., adds to the understanding of ALS pathogenesis, it also underlines the heterogeneity of ALS. Neurodegenerative conditions very rarely improve - if ever. This outlook may now be changing, but there can be no guarantees or assurances of efficacy. Whereas it is imperative that one maintains a positive mental attitude and optimism, likewise, it is most important not to acquire unrealistic expectations. It may not help you - people differ in their response to any medication. Whether or not you ask us for treatment is your decision. On the basis of the current limited available evidence at this time ( ~ 4,000 doses by 2017), it will probably slow the progression of your ALS. Some may have views about the implications of living longer. (Refer to the above chart. Also refer to EFFICACY ). 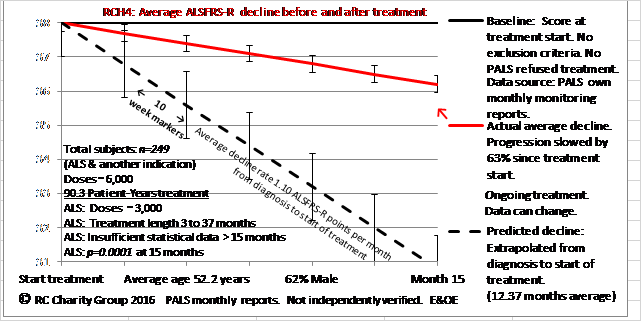 For some PALS, it stops the decline (it stabilises) of their ALSFRS-R score condition over time. You should also consider the implications of this. ALS is a highly variable condition and PALS are also highly variable in their response to treatment. Random charts for RCH4 (an investigational drug not yet approved) which may be representitave of the overall ALS population can be seen HERE. Familial cases can be seen HERE. Although RCH4 has an outstanding safety record and no notable related side effects have ever been reported to date after decades of continual patient-treatment-years, there is always the potential for side effects with any drug. You would take RCH4 entirely at your own risk. Note: Applications by this charity to the ALS funding entities for support to treat PALS have always been declined. We have never received any funding support from any source. However, in 2010, the ALS `Prize4Life`charity generously gifted us valuable transgenic mice for research. Despite far greater public recognition and hundreds of millions of charitable fund raising for the ALS research organisations, the cause has not been understood and although many drug trials have been undertaken, none of them slowed the progression and no successful drugs have been developed. Neurodegenerative issues are one of the most difficult areas of medical research. Genes do everything. Genes make each one of us who we are. Genes dictate what we look like, our eye and hair colour - but genes can also cause defects in us. Currently, there is much focus on the potential for gene therapy which may have diverted effort and funding away from research in the field of biochemistry and immunology. A quick search will reveal that perhaps 85% of work is in gene test tube, stem cell and mouse model work, a very long way - years - before actually treating patients. Whereas this new drug RCH4 demonstrated an 18% increase in the life of transgenic mice with very aggressive ALS, that does not necessarily indicate that such results will replicate in PALS. Mice are not people. In fact the RCH4 data indicates an average life extension in PALS of more than 240% and for some, far more than that. ALS mouse models have never translated into human and ALS mouse research has never produced a new ALS drug. The solution to many diseases will probably one day come in the form of stem cell or gene therapy. When (or if) it does, it will be many years away. ALS cannot wait and needs a better solution right now. The origin of this newly discovered, previously unknown, antagonistic protein which promotes ALS (and which this new drug safely and successfully suppresses) most likely lies in a gene anomoly. When Watson and Crick et al discovered DNA in 1953, it was a seminal breakthrough, enabling research into genes. However, in the 63 years since than, immense scientific insight has been achieved, but little or no practical clinical progress in gene therapy has emerged in all that time. As gene therapy will not be available for ALS any time soon, then the offending protein must be controlled instead. This can definitely now be done with the new ALS drug RCH4. This new ALS drug is a completely different approach, made possible by the discovery of an excitoxic protein previously unknown. Early clinical evidence indicates that this drug is effective, safe, and may potentially be a breakthrough, but that is a long way away yet from being certain. Certainty can only be achieved by large scale clinical trials lasting a number of years. Due to our lack of funding, no clinical trials of this new drug are likely in the foreseeable future. The RCH4 drug may also be effective in the treatment of Alzheimer's, FTD, Parkinsons and some other neurodegenerative issues. However, due to our lack of resources and consequently, insufficient treatment numbers in those conditions, no trials have been undertaken and therefore no useful clinical data has been obtained in those conditions. ALS was first noted in 1824 by C. Bell, a Scottish surgeon, However, there was no technology available to investigate it other than reporting the observed symptoms. It was a complete mystery. Subsequently J. Charcot, a French neurologist, formally described ALS about 1870 and who hypothesised the workings of the nervous system. He was so accurate in his observations of the broad pathology involved, even today, in some countries ALS is referred to as "Charcot’s disease". ALS remained obscure until 1939 when a famous sports personality in the USA, Lou Gehrig, developed the condition. By that time research facilities were available to achieve a better insight into the pathology - but the cause remained unknown. After the passing of Lou Gehrig, the public became more aware of ALS in the USA. In 1995, Riluzole™ developed by a European company, became available as the first drug for ALS. A Riluzole clinical trial in some 900 PALS indicated an extension of 60 to 90 days in the time to tracheotomy . Whether it slowed the progression of the disease or not in that trial is unclear to the author as it is not referred. Slowing the time to tracheotomy is not exactly the same thing as life extension. By 2010, most people recognised the condition due to the high profile and global fame of physicist Professor Stephen Hawking, who, extraordinarily, lived with ALS for some 55 years. It is surmised that he recently passed from an infection at the age of 77. A man who exhibited humour, great courage and mental determination to fill his life with intellectual achievement which he attained with outstanding success. His long survival may in some part be due to those extremely important attributes. A sense of humour in spite of the difficulties, try to mentally smile, have an intellectual hobby, a target or objective to achieve, and a determined, positive attitude are excellent drugs in their own right. Please read that last sentance again.